Prince Amenhotep (IV) ("Amun is at Peace") was the second son of Nebmaatre Amenhotep (III) and his Great Royal Wife, Tiye. The young prince had one older brother, the Crown Prince Thutmose. He also would eventually have at least five sisters, Sitamun, Isis, Henut-Taneb, Nebetah and Beketaten. Amenhotep, as the son of pharaoh, would have had a pleasant childhood; but, he must have been in the shadow of his older brother, the Crown Prince Thutmose. It was Thutmose who was supposed to follow their fahter as Pharaoh. 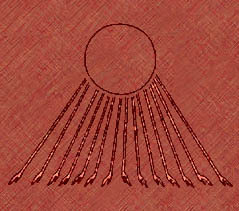 During Amenhotep's time as a prince in his father's court, the senior Amenhotep was giving a lesser known aspect of the sun, the physical disk, the Aten, more prominence in the Egyptian pantheon. This was most likely done in an effort to lessen the power of the priesthood of Amun, as they were ever becoming more and more wealthy and influential in the politics of Egypt. Amenhotep III even had a pleasure boat named "The Aten Gleams" or "The Aten Dazzles". While the Crown Prince was in Memphis as the High Priest of Ptah, young Prince Amenhotep may have served as a preist himself, in On (Heliopolis), where he would have learned more about solar theology. He should have grown up to serve his father and brother in the priesthood, but that was not to be. Tragedy struck: the teenaged Crown Prince Thutmose died. No one is sure what killed the young prince, but with his death the course of Egyptian history took a drastic turn. Late in the reign of Amenhotep III, the new Crown Prince Amnehotep married Nefertiti, who was most likely his cousin, the niece of Queen Tiye. Over the next ten years or so, Nefertiti would give her husband six daughters: Meritaten, Meketaten, Ankhesenpaaten, Neferneferuaten taSherit, Neferneferure, and Setepenre. She would bear him no sons. Amnehotep assumed the role of Pharaoh with the name of Neferkheperure Waenre Amenhotep, ("Beautiful are the Manifestations of Re, Sole One of Re") but that name would not last long. Farily early in his reign, Amnehotep IV married Kiya, who may or may not have been a foriegn princess, Tadukhipa of Mitanni, and had been previously married to Amenhotep III. She was given the title "Greatly Beloved Wife," and was his most-prominent wife after Nefertiti. The new city was called Akhetaten, or "Horizon of Aten". It was located about halfway between the traditional religious capital of Egypt, Waset/Thebes, and the traditional secular capital, Men-Nefer/Memphis. At this time, he changed his name to Akhenaten, and Nefertiti recieved the additional name of Nefernefruaten. The Aten became the only official god worshiped in the new city. The priesthood of the Hidden One would have no power in this bright, sun-light city. Akhenaten's reign did not just bring religious reforms, but artistic ones at well. Akhenaten was shown with long spindly arms, and a feminine figure. It has been suggested that perhaps this is evidence of disease, or kind of like a charicature; an exaggeration of the king's possibly slighlty feminine appearance. He was also portrayed with a long face, heavy eyelids, and full lips. His daughters were protrayed with enlogated skulls, and Egyptologists still debate whether this was a true-to-life depiction or if it was just a new artistic stylle. Later in the reign, the rough exaggerated style gave way to a more realistic one, in which the famous bust of Nefertiti was fashioned. After a great celebration in year 12, things in Akhenaten's life began to go down hill. At least one of his daughter, Meketaten, and possibly three (Neferneferure and Setepenre) died. Shortly thereafter Nefertiti and Kiya either died or fell from favor (or, perhaps in Nefertiti's case, became co-regent). His mother, queen Tiye, also passed away. It is at this time that some say he married Meritaten, his beloved eldest daughter. When Meritaten later became the Great Royal Wife of the mysterious and ephemeral co-regent, Smenkhkare, many assume Akhenaten took his next-eldest surviving daughter, Ankhesenpaaten, as a wife. Akhenaten died in his 17th regnal under unknown circumstances, leaving Egypt terribly weakened. 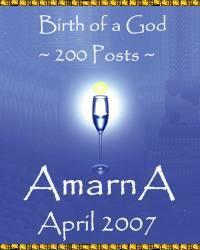 The Amarna Experiment was a disaster. Without Akhenaten, Atenism quickly failed and Egypt reverted to their polytheistic pantheon. When Smenkhkare, too, disappeared, the boy-King Tutankhaten ascended the throne, with Akhenaten and Nefertiti's daughter Ankhesenpaaten as his Great Royal Wife.